As Paul noted last night, the word in Washington is that John Boehner now hopes to escape from the current fiscal stalemate via a “grand bargain” that will include raising the debt ceiling in conjunction with some sort of entitlement and tax reform. I have written many times that I oppose fiscal grand bargains, especially when they are crafted in secrecy, in the middle of the night and in an air of crisis. The likelihood that conservatives will come out with a respectable agreement under such circumstances is negligible. Byron York has more on the current state of play in Washington: Out of ideas, House GOP considers Hail Mary. As the partial government shutdown enters its third day, many House Republicans are determined to keep fighting, even though they see no plausible way out of the current impasse, because they’ve come so far they cannot imagine backing down now. “I think there’s a sense that for us to do a clean CR now — then what the hell was this about?” one Republican House member told me. Wednesday was the best day in a while for Republicans, but not because of any progress they made toward their goal of defunding, delaying, or limiting Obamacare as part of a resolution to fund the government. Rather, Wednesday was a good day because Democrats handled their end of the crisis so badly. 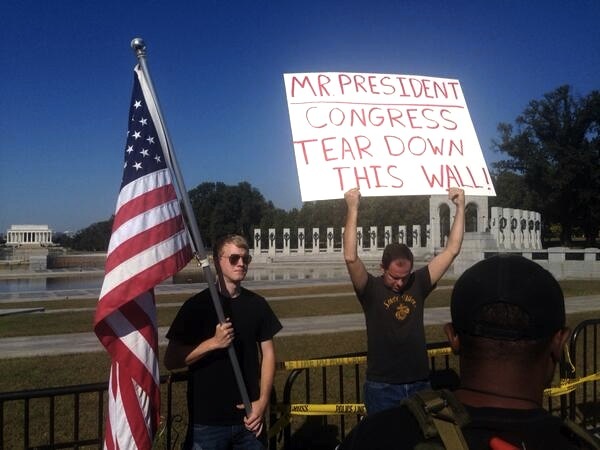 First, the Obama administration inexplicably went out of its way to barricade popular open-air monuments and memorials on the Washington DC mall, in particular closing off the World War II memorial to groups of elderly, Greatest Generation veterans who had come to the capital to pay their respects to a heroic moment in American history. Republicans couldn’t believe what they were seeing. “That looked atrocious,” said one well-connected GOP strategist, who suggested it proved once and for all that the ham-handed Barack Obama is no Bill Clinton when it comes to handling a government shutdown. Then, Senate Majority Leader Harry Reid badly bungled a question about a House Republican bill that would fund, and re-open, the National Institutes of Health. “If you can help one child who has cancer, why wouldn’t you do it?” asked a reporter. 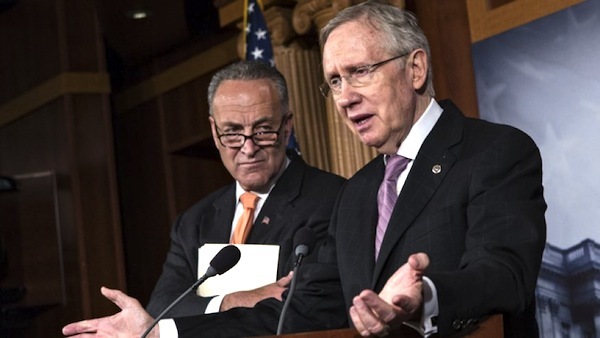 … By late Tuesday, Reid was reduced to pledging that he does, indeed, care about children with cancer. For Republicans, the problem is that they don’t know how to get out of the impasse they created when they embarked on a strategy to attach Obamacare measures to continuing resolutions needed to fund the government after Sept. 30. Senate Democrats and the president rejected all of them, Sept. 30 came and went, and now the government is partially shut down. So what now? House Speaker John Boehner and leading Republicans like Paul Ryan and Dave Camp are apparently reviving the old goal of a “grand bargain” — a budget deal that would include entitlement reforms, tax reform, and a new budget agreement, while also restoring government spending and raising the debt ceiling. The idea is that with the debt ceiling deadline coming up on Oct. 17, Republicans and Democrats could fix all, or at least many, of their problems in one fell swoop. Such “grand bargain” attempts have failed in the past, and there is little reason to believe one will succeed now. And not just because Obama and Democrats are intransigent, which they are. The fact is, this is Oct. 3, meaning there are just two weeks before the nation hits the debt ceiling. Could Republicans get even their end of a “grand bargain” together in time? “Look at tax reform,” said the GOP strategist. “If you took Democrats out of the mix entirely, I don’t think Republicans could come up with a tax reform package by Oct. 17. There is a huge range of opinion on what direction to take.” The first “grand bargain” Republicans would have to reach would be among themselves. Nevertheless, some Republicans are grasping at the idea that a “grand bargain” will somehow solve their problems. In my view, it would be far better for Republicans to throw in the towel, pass a “clean” continuing resolution to fund the government for a few months and move on to the next battle, while lamenting the Democrats’ intransigence, than to panic and enter into a cosmic deal that could put the nation on an even more disastrous fiscal path. Here is a novel idea: what we really need is a budget. We have in place a framework, the Budget Act of 1974, which imposes legal requirements on the House and the Senate to produce annual budgets on a stipulated time line. This is how the system is supposed to work: House and Senate committees each produce budgets in an open and transparent process, whereby amendments are proposed and voted on. The budget then moves to the floor of each house, where there is more debate and a further amendment process, culminating in passage of a House budget and a Senate budget. If the budgets are different–as they surely will be–a conference committee reconciles those differences, and the resulting consensus budget returns to each chamber for a vote. If the budget passes both houses of Congress, it is signed (or vetoed) by the president. The Budget Act sets deadlines for each stage of the process that are intended to insure that by the end of each fiscal year, appropriation bills can be passed to fund the succeeding year’s activities. The whole process is transparent and open. This statutory budget process has completely failed to operate throughout the Obama administration. Why? Because the Democrats have chosen to disregard their legal obligations under the 1974 Act. The Democratic Senate went for more than four years without adopting any budget at all, and Harry Reid openly scoffed at the idea that the Democrats had any obligation to follow the law. It is the abandonment of the statutory budget process that has put the government in the position we currently see, where the end of each fiscal year is accompanied by an atmosphere of crisis and confusion. The path to fiscal responsibility is not another secret, midnight deal, but rather a return to an open, legally-mandated budget process.